Maine’s mid coast region paints a picture postcard worthy scene of quaint towns, tranquil harbors and miles and miles of coastline where lighthouses dot the landscape. Camden, the most popular and polished of the towns along Penobscot Bay, attracts tons of visitors during the peak summer months to its picturesque harbor. Rockland, once run down and scruffy has undergone a renaissance in the last few years boasting a vibrant food scene, and a downtown stretch filled with art galleries and museums, a gourmet marketplace, vintage theater and boutique stores. If you’re driving from Southern Maine, NY or Boston, you will pass through the historic town of Wiscasset, fondly known as the prettiest village in Maine. The small town has an abundance of architectural landmarks, charming small boutiques, and high-end antique stores. One of Wiscasset ‘s most well known establishments is Red’s Eats, a roadside hut just south of the bridge, famous for one of Maine’s best lobster rolls. The market price roll, averaging a hefty $24.00, contains a whole lobster’s worth of undressed meat (mayo or butter served on the side) This is no secret spot, during the late spring and summer, there are constant long lines and long waits. Stay: If golf is on the agenda check into the Samoset Resort located oceanfront in Rockland. We think the property feels dated, but the location is picturesque. For a more modern feel in Rockland try the Lindsey Hotel, a boutique option located in the historic waterfront area, within walking distance to town. In Camden check in to either the renovated Whitehall Inn (reopened last year and featuring the restaurant Pig and Poet) or the Camden Harbour Inn, a luxurious B & B, part of the Relais & Chateaux Group. Morning in Rockland: Start your day at Rock City, on Main Street, soon to be your new favorite local coffee house, complete with its own in house bookstore, Hello Books. Walk on Water: This is not your ordinary morning stroll! Walk carefully along the Rockland Breakwater, a 4.300-foot long granite path leading to the historic Breakwater lighthouse—built in 1899. It’s a flat, mile long hike out into the bay (2 miles round-trip) where you’ll be greeted with beautiful panoramic views of Rockland and Penobscot Bay. Breakfast: Go early or be ready to wait in line at Home Kitchen Café. Many swear by the lobster eggs benedict and a side of sticky buns, but we had read the huevos rancheros were voted one of the best dishes in the state. (Yes, order them!) Newer in town, Broken Egg is a hip, lively café serving an eclectic menu with highlights including banana bread french toast, carrot cake pancakes and a lobster frittata. Art Tour: A highlight of any trip to the area is a visit to the Farnsworth Art Museum, one of the top regional art museums in the country celebrating Maine’s role in American art and highlighting some of America’s greatest artists. In addition to the main building, our favorite is The Wyeth Center showcasing the work of three generations of Maine’s First Family of American Art: N.C. Wyeth, his son Andrew Wyeth, and Andrew’s son, Jamie Wyeth. Two other buildings, the Farnsworth Homestead and the Olson House, plus Julia's Gallery for Young Artists complete the museum complex. New Kid on the Block: Across the street, stop by the Center for Maine Contemporary Art in its stunning new home designed by NY architect Toshiko Mori. Lunch: Chef Lynn Archer of the Brass Compass beat Bobby Flay in a throw down with her lobster club, earning the name “king of the lobster”. Tiny, funky Café Miranda is a favorite place for lunch or dinner. 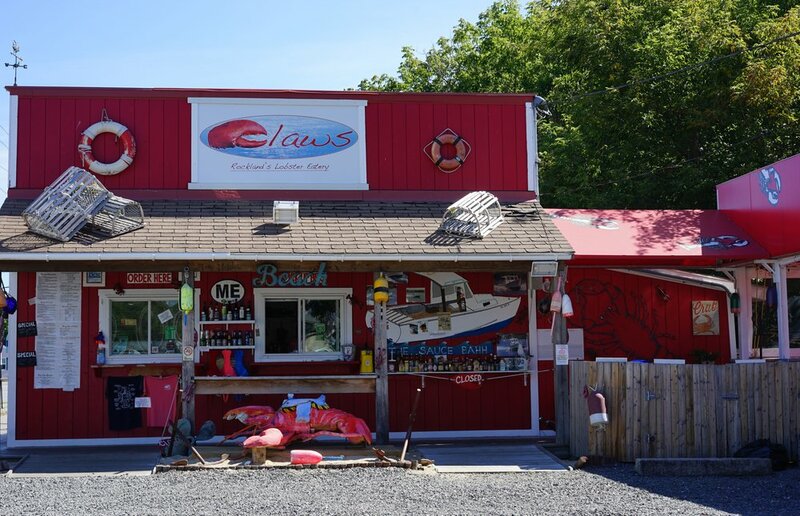 A lobster roll is an iconic treat when traveling in Maine; sample one at roadside Claws. Order some fried clams as well and add heat to their full service sauce “bahh”. Water Views: The coastline surrounding Camden Harbor is considered by many to be one of the world’s prettiest. Depart from the harbor on a two-hour sightseeing cruise, either by sailboat or motorboat. Out on the water keep your eyes open for seals, eagles, ospreys, and porpoises all while enjoying the view of small islands, lighthouses and the lobster-men at work hauling in their traps. To get your close up of the coast book a trip here. Another option is to do a sea kayak tour with Maine Sport Outfitters. Dinner: If you have one dinner, there’s one choice--Chef Melissa Kelly’s charming Primo, still going strong after 15 years, and widely considered by many to be one of Maine’s best restaurants. Book a seat well in advance for the downstairs of this Victorian house, or dine upstairs in the laid back bar area, left open for walk-ins. If there’s a wait, order a drink and wander Primo’s on premise farm that provides 80% of the menu’s produce in season. Casual Suzuki’s, also in Rockland, serves up some of Maine’s best sushi rolls using local fish and seafood. Over in Camden book a table at popular Francine Bistro where the farm to table menu changes daily. Long Grain has been garnering rave reviews; fans claim it serves some of the best Thai food anywhere—on our list for next summer.